Jimmy Smits. Photo by Prashant Gupta/FX. In the competitive landscape of cable television, the biker drama Sons of Anarchy continues to deliver strong ratings. 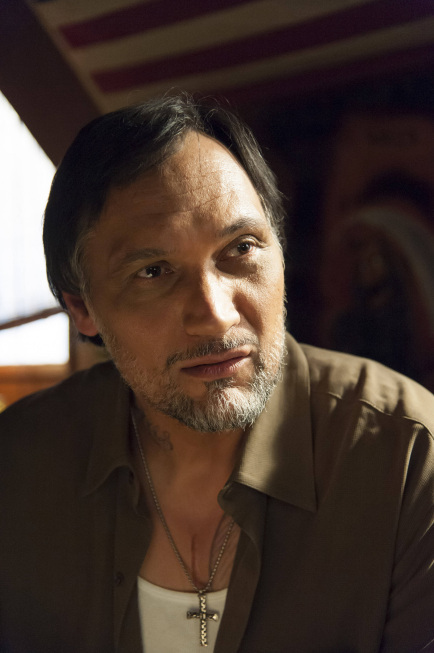 Part of the show’s secret to success is its all-star cast, which includes veteran actor Jimmy Smits (NYPD Blue, Star Wars: Episode III – Revenge of the Sith) in his role as Nero Padilla. In a recent interview with StayFamous.Net, Smits talked about the popular series, now in its fifth season on FX. Jimmy Smits: “What I saw in season three, which really cemented for me that the show had jumped to a different gear with that whole—for lack of a better word, the whole Irish storyline that was introduced when they went to Belfast. That whole back and forth was really quite intricate. A lot of it, I thought that they were in Ireland for real. I was believing that they were somewhere else, and a lot of it was shot here. They did go and do some skeleton work to do exteriors out there, but that was really quite, quite wonderful—Titus Welliver, who’s a friend from NYPD Blue days, and now he came in and did a wonderful job with them. The performances there were very, very intricate by everyone involved, and jacked up the storyline to another kind of level. 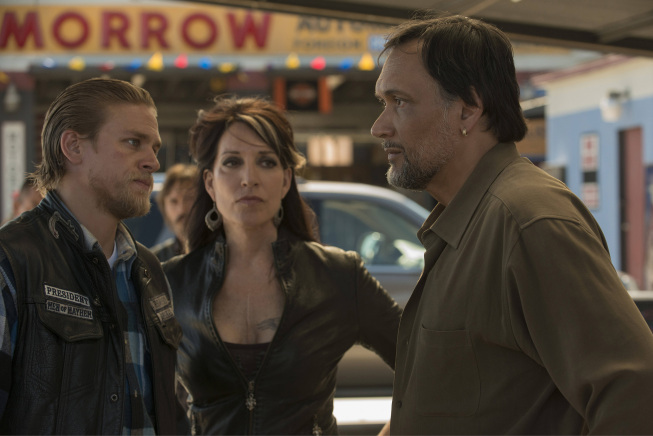 Charlie Hunnam as Jackson ‘Jax’ Teller, Katey Sagal as Gemma Teller Morrow, Jimmy Smits as Nero Padilla. Photo by Prashant Gupta/FX. Jimmy Smits: “Keep watching. We’re so very, very happy that this season that loyal fan base that has been around has grown exponentially. To hear all of the wonderful things that we have around the table when we’re reading new scripts or out there in the grittiness of the motorcycle deserts riding around with—when the guys are riding around, that fan base has increased, and the numbers have increased exponentially. Sons of Anarchy airs Tuesdays at 10 p.m. ET/PT on FX.